citizens to send a text message directly to 9-1-1 for assistance in the event they are unable to make a voice call. the individual needing emergency help. It is important to remember that text to 9-1-1 services should only be used in an emergency situation when someone is unable to speak. Examples include if the person is deaf, hard-of-hearing, speech impaired, or when talking out loud would put the individual in danger. Text-to-9-1-1 also provides a silent alternative in cases such as child abduction, active shooter or domestic abuse. When texting 9-1-1, you need to know your exact location and the nature of your emergency. Use simple language and no abbreviations or slang. Please do not text and drive! Pull over to a safe area before sending a text to 9-1-1. If you are able, please call 9-1-1. It takes longer to get all the information when communicating through text messages. receive a ‘bounce-back’ message telling you to make a voice call. 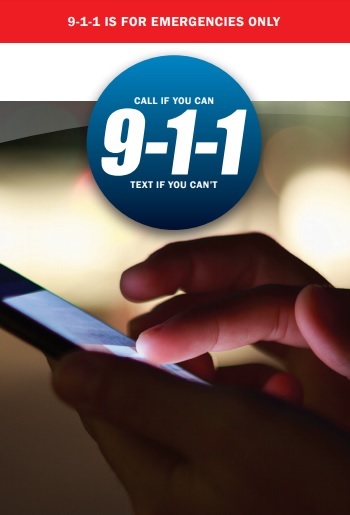 If you would like more information about Text-to-9-1-1, please contact Rea Washington, 9-1-1 Program Manager at 903-255-3521 or email at rwashington@atcog.org. You can also visit the COG’s website at www.atcog.org.